What do you do with 5 pounds of tomatoes? I like BLTs but a sandwich now and then is not a productive way to use up all the ripe tomatoes that are in season right now. I got a really big bunch yesterday from my local farmer’s market and since I’ll be going away on vacation in just a week, I had to do something to preserve them right away. I’m in an Italian state of mind, so guess what I did? Italians like canned tomatoes. 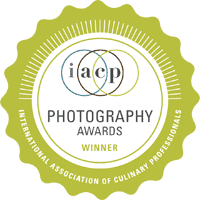 They argue that you can hardly get better tomatoes than canned San Marzano, picked at their ripest and preserved in a matter of hours. It is indeed a great way to enjoy the fresh taste of tomatoes year round. However, when tomatoes are in season, it is a bit of a sin to think of using their canned counterparts (even Italians will agree). Of course, you have to gather the courage to peel your tomatoes, chop them up and cook the sauce for a while, but once you’re done, you realize it was much quicker and painless than you remembered. And that the vivacious taste of a fresh tomato sauce is incomparable. It’s much easier than you think. Bring a big pot of water to a boil. Slice a shallow “X” on the bottom of each tomato. Plunge them in the boiling water until you see their skin roll back, 10 to 15 seconds. 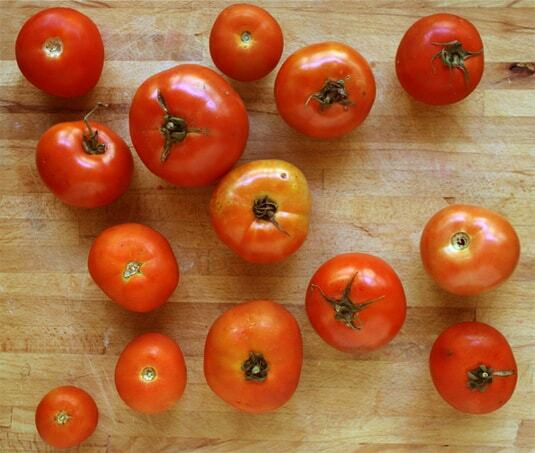 Fish them out: you’ll see that your tomatoes are ready to undress without much help. You’re done! 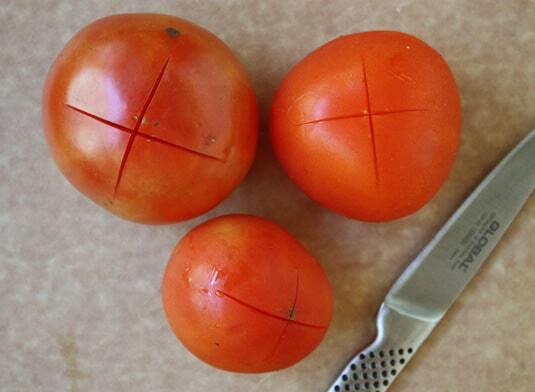 Slice a shallow “X” on the bottom of each tomato. Tomatoes, after 10-15 seconds in boiling water: ready to undress! 5 pounds of fresh and peeled garden tomatoes. 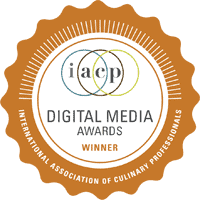 Thick-fleshed and not-so-juicy varieties, like Romas, San Marzanos and other plum-shaped varieties make the best sauces because they contain less water, thus take less time to cook. 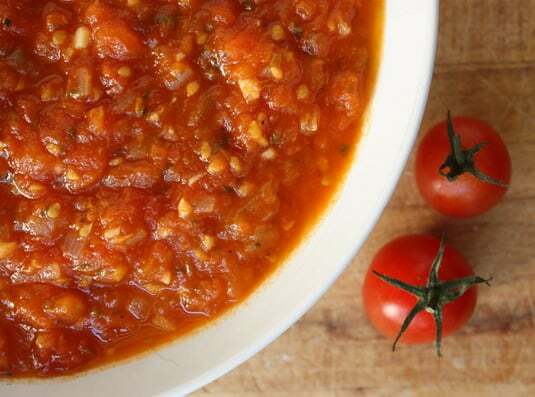 You can use any variety; if you choose plum and juicy tomatoes, you’ll just have to let your sauce simmer longer. Humble (but very tasty!) garden tomatoes. 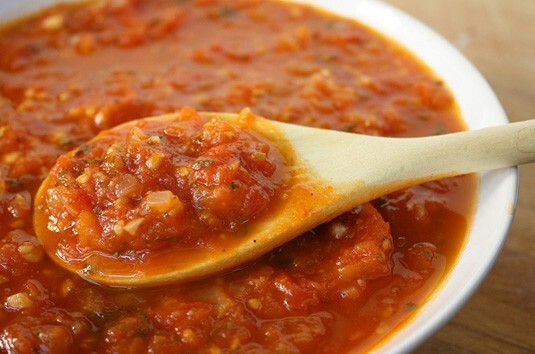 A very basic fresh tomato sauce is seasoned solely with salt and pepper. From there, you can add onion, herbs, garlic or red pepper flakes. Optional fresh tomato sauce seasonings: onion, garlic, dried oregano, red pepper flakes, fresh basil. Incorporate cooked veal, lemon and thyme meatballs and serve with spaghetti. This is my favorite way to make a fresh tomato sauce. 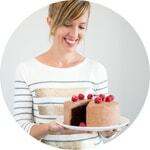 When I first made it, I turned to my vegetarian bible, Vegetarian Cooking for Everyone by Deborah Madison, for basic guidance and then built my own version. I love it with all the flavorings because, that way, I think it’s ready for use in a variety of ways (see above). I even stray from tradition by using a bit of white wine to deglaze my pan after the onion, garlic and red pepper flakes have cooked together. I find it deepens the flavors and mellows the fresh (and sometimes acidic) tomato taste. Some people will argue that adding fresh basil to a hot sauce isn’t a good idea. 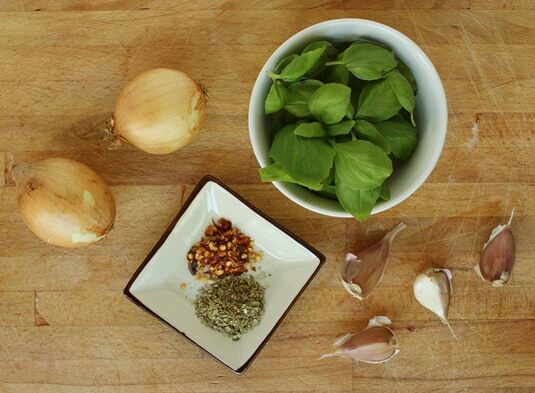 Basil is a delicate taste and it must be added to the sauce at the right moment. Freezing and high heat will kill the basil’s flavor. If you plan to freeze your sauce, don’t add basil at all. Remember to always add it right before serving, when the sauce is hot but off the heat. That way, the basil will delicately infuse the sauce with its flavor and you’ll be able to taste it. 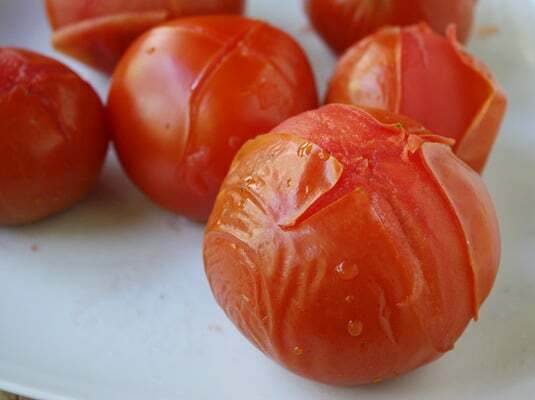 Peel the tomatoes: Bring a big pot of water to a vigorous boil. Slice a shallow “X” on the bottom of each tomato. 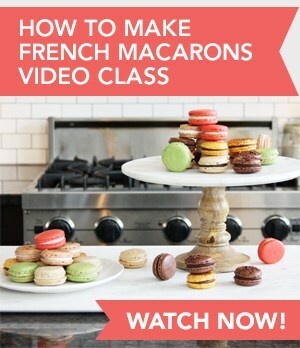 Plunge them in the boiling water until you see their skin roll back, 10 to 15 seconds. Fish them out and let them cool for a couple of minutes before removing their skins. 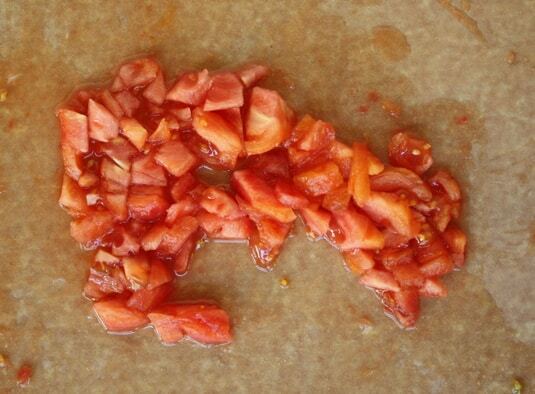 Do this step in 2 or 3 batches to make sure there’s just one layer of tomatoes in your pot at a time. Prepare the tomatoes: One the tomatoes are peeled, chop them roughly, or very finely, depending on how you like your sauce. Keep everything in a bowl: the flesh, the seeds and the juice. Cook your base: Heat the olive oil in a big pot over medium-low heat. Add the onion, garlic and red pepper flakes and cook until wilted and translucent (don’t let it brown! ), about 5 minutes. Pour the white wine into the pot and scrape the flavorful bits that may have stuck to the bottom of the pot. Let the wine evaporate (about 3 minutes more). 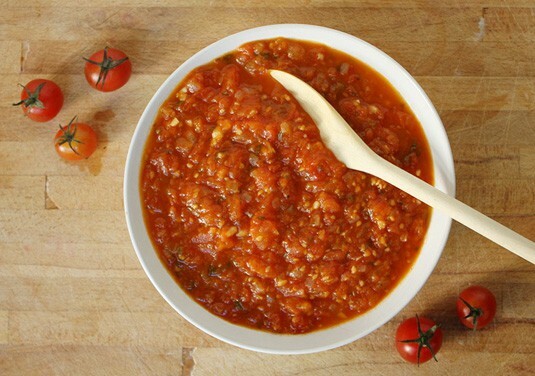 Simmer your sauce: Addthe chopped tomatoes as well as the oregano, ½ teaspoon sea salt and freshly ground pepper to the pot. Raise the heat to medium-high to bring the sauce to a boil then turn the heat to low again to let it simmer, uncovered. Stir once in a while. Your cooking time will vary from 20 to 45 minutes depending on the kind of tomatoes you used (less time for Italian varieties; more time for regular garden tomatoes). You want your final sauce to be thick, not watery. 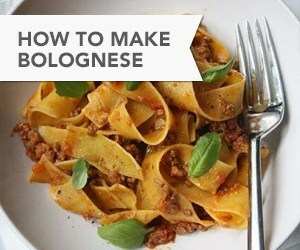 A trick is to look at your sauce before stirring it when it has simmered for a few minutes. At first, you’ll see a thick layer of watery juices rise to the surface. As your sauce cooks, you’ll see less and less of that juice rising. The sauce is ready when it’s topped with just a thin layer of juice and you see tomato chunks surfacing here and there. 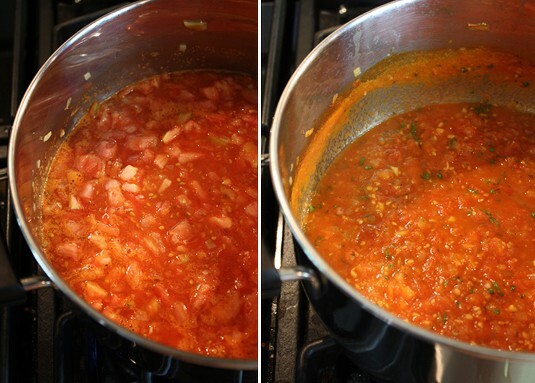 Fresh tomato sauce, before and after simmering. When your sauce has thickened, turn the heat off and taste it. You’ll need to add ½ to 1 teaspoon more sea salt. Add the chopped basil if you’re ready to enjoy your sauce right away. Otherwise, let your sauce cool and freeze it for a later feast. This sounds really nice. 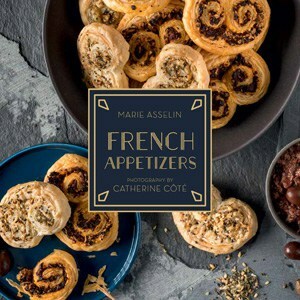 Always looking for new recipes to try. Thanks for sharing. 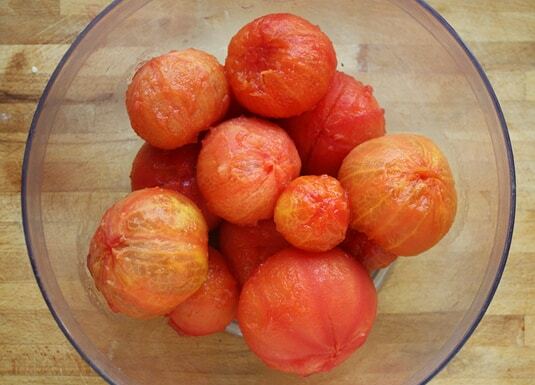 Until I found your recipe, I was giving away tomatoes to family & friends every week. Now I’m keeping all of them to make sauce. My family loves this so much I could feed this to them 3 times a week. Thanks. A bounty of tomatoes can be like a bounty of zucchini: after a while, you don’t know what to do with it anymore! Fresh, homemade sauce is a real treat and canning it makes the pleasure last all winter. Happy sauce-making! I made your fresh tomato sauce this evening and it was great! I had a bunch of fresh tomatoes from my garden and was wondering what to do with them. I found your recipe and my family was not disappointed. I substituted vinegar for the white wine since I did not have any and it was perfect. Gigi: I'm happy you loved the recipe as much as I do! How did you serve it? I ended up making a vegetarian lasagna with a spinach béchamel. Delicious! Marie: It was late so I just served it over thin spaghetti. It was good. My neighbor brought me over a huge bag of tomatoes from his garden today, so I plan to make another batch and freeze for the winter months. Thanks again for the recipe. I wish I had enough tomatoes on hand for a beautiful fresh sauce like this tonight–the few I have, I've been slicing and salting and gobbling so fast that they don't have time to pile up!